Like last week, conditions were very good. Warm – 21 degrees, very low wind and low air pressure; it would have been hard to have better weather conditions. 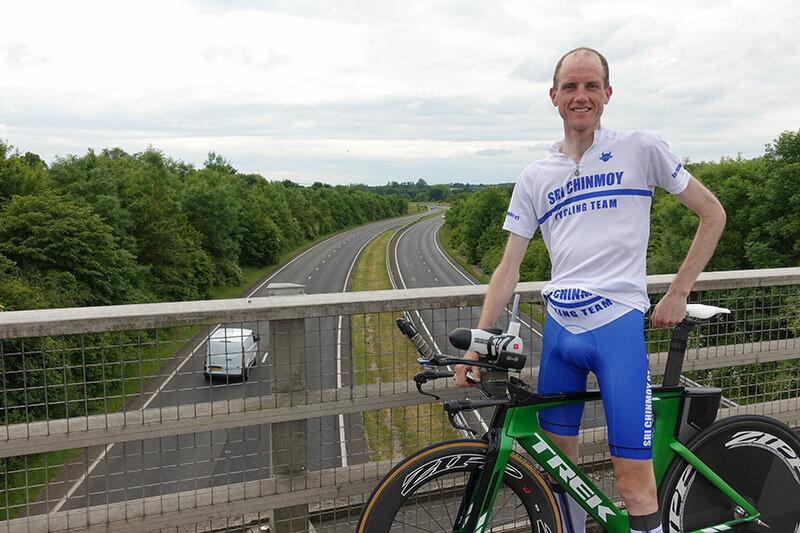 I have been training quite a lot in past two weeks with National 12 hour TT and National 100 in mind. Two century rides in the past 8 days. Although a lot of miles, I haven’t been doing any hill intervals for quite a few weeks. Last week, 15 mins pre race, I was scrambling around in the car for an allen key and had to dig one out of a saddle bag, right at the bottom. So I went to local bike shop and bought a set of allen keys – specifically to live in my car boot. It was a great idea, though I managed to leave this set of allen keys at home and I didn’t have any allen keys to hard. I warm up on training wheels, then with 20 mins to go, put on racing wheels. The problem is that the Zipp 808 are much wider than any other wheels, so the brakes were rubbing. I looked for a fellow competitor who might help. Number 71, my minute man was making a last minute change to his shoe cleats (so it wasn’t just me), but he still found time to dig out a small multi-tool and I was able to undo the brakes and was free to ride. Over 12 years of doing time trials, I’m still learning that equipment and being organised is as important as the cycling part. Now, for every race, I’m trying to make any necessary aero savings, and use the most aero equipment (and be organised). I was also testing a new helmet I bought on Thursday – A Giro Selector. I will review later in week, and explain why I bought a helmet after aero testing several in Newport. In my last 25, I seemed to start off too conservatively, gaining more power over the event. 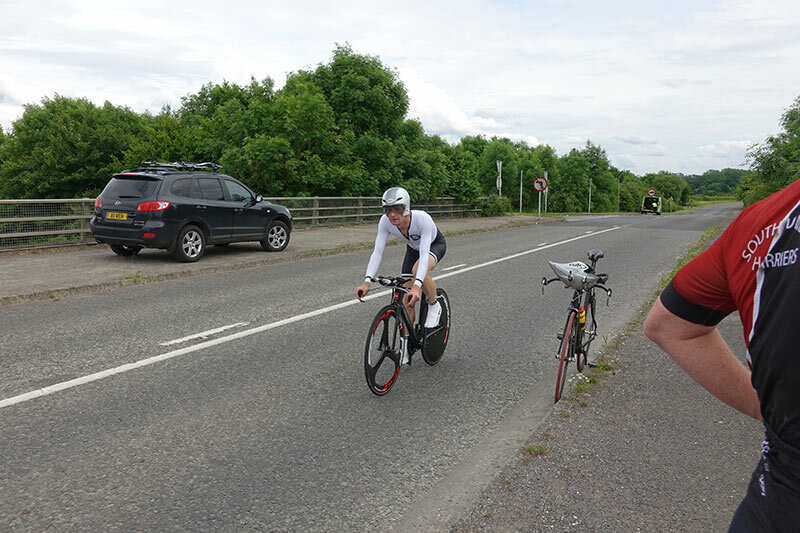 So this time I went out harder – pretty much like the 10 mile TT last week. The first part of the Bentley course is the hardest, a few long drags to take the edge off your speed. Heading east was a little faster, helped by a gentle tailwind. I was fading a little on the last 5 miles, but that was the quickest part of the course, so it didn’t really matter. I was surprised to set a time of 49.11. I have never been under 50.30 on this course. And 49.11 is an all time personal best – beating a 49.36 on the downhill Welsh course. It was just one of those rare days where everything seems to go together – weather, form, conditions. It was a good day, the tandem pair (Mark Arnold + Chris Hopkinson) set a time of 49.31. Chris is doing the Newbury 12 hour tomorrow, so it was a good warm up. If I knew I was going this well, I might have entered the National 50 this weekend, but then if I had entered the Nat 50, it would have been hard to do training for national 12 hour at the same time. Thanks to Redmon CC for putting on event. I think it is first time I have done a Redmon event as they usually promote further south in Surrey. I broke my 25 mile PB six times during 2005, then had to wait five years. I set first sub 50 minute time on a visit to S.Wales on the ‘superfast’ R25/3 course. This is first pb for five years. 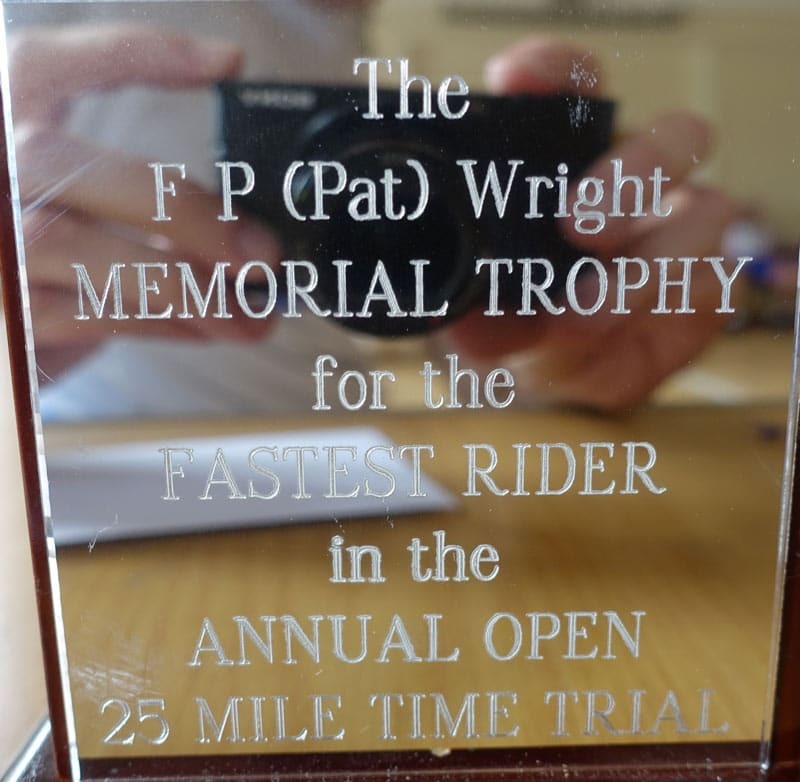 I won the Patrick Wright Memorial Trophy for the fastest rider in the annual Open Redmon CC 25 mile time trial. 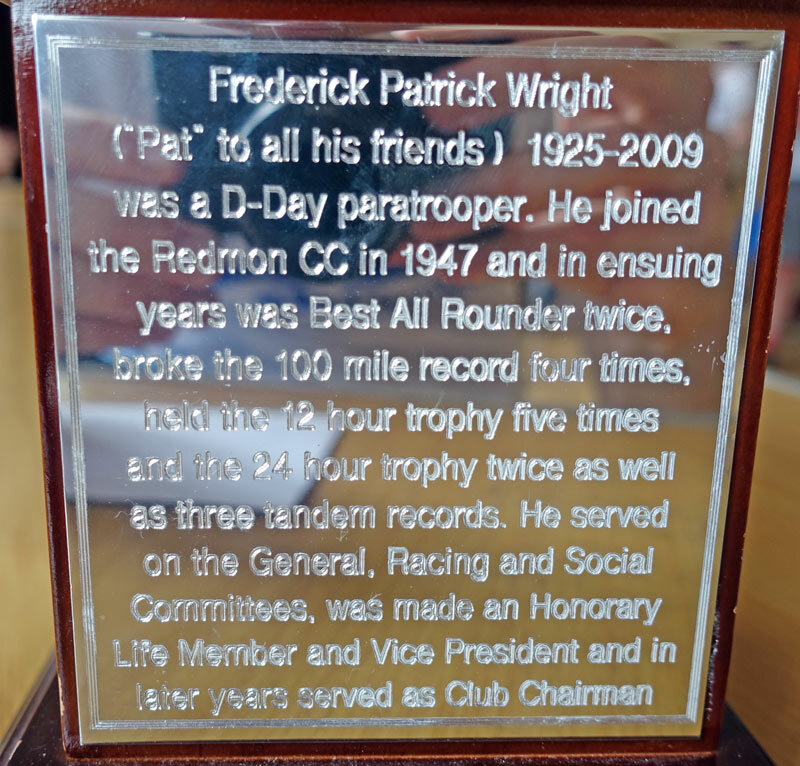 P.Wright was a great clubman. Serving Redmon CC since its early days, from the late 30s through the ‘golden age’ of the 1950s and 60s. It was in the days when individual clubs would have keenly contested BBAR competitions within the club itself. 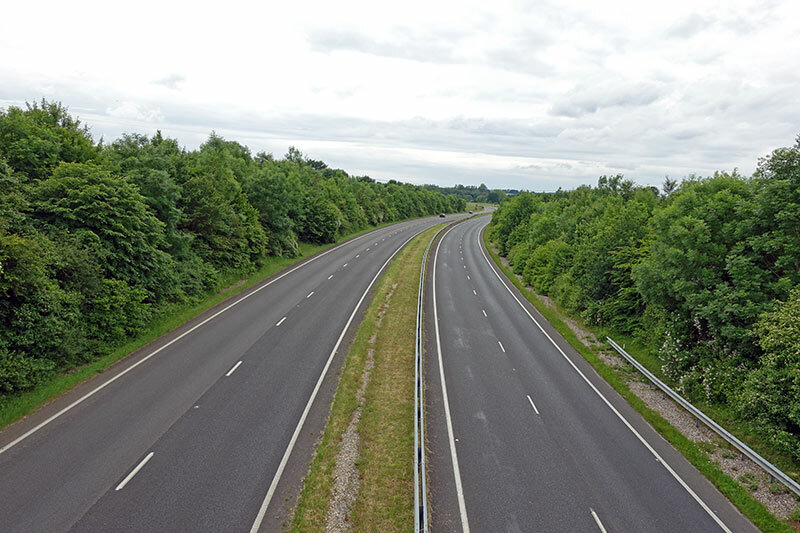 The A31 on a Saturday afternoon. I shall add to my collection of “great dual carriegeways of southern England”. To pre-order the 2017 calender, let me know. After race with skinsuit tucked under jersey. Two riders from South London Harriers triathlon club. First 25 mile TT. Great ride Tejvan on a course more honest that R25/3. Impressive power with it, how are you feeling about the reliability of the powermeter? You’ve mentioned concerns before now but I suspect those numbers are ball park for a 30mph+ ride on this course. My guess is slightly overstating, I think improvement due to Cda rather than power. A very good ride indeed Tejvan – well done. Some excellent pictures too, especially that one of ‘a rider post race’. Just joking as it’s me. At least it’s not a close-up! Good to meet you Tejvan, congratulations on an awesome performance, hope to see you at a few more this season!